After losing some sleep researching all the options, our recommendation for the absolute best mattress topper is the Layla Topper. 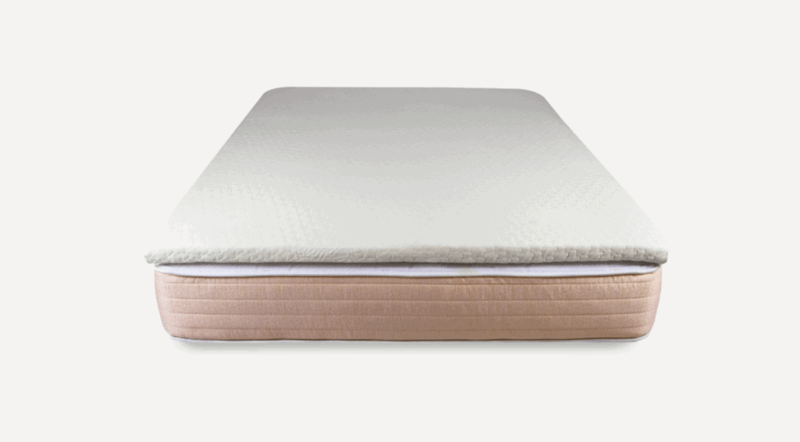 With 2 inches of copper-gel infused memory foam, this topper is cozy, cooling, and supportive. It’s versatile enough to suit every sleeper. But Layla is far from your only option. We have 12 other winners that’ll have you drifting off to dreamland in no time. Few things in life are one-size-fits-all. Mattresses, and mattress toppers, are most definitely not one of them. Some are suited for stomach sleepers more than back sleepers. Some are perfect for those who need more support, while others are ideal for those who want snuggly, plush comfort. 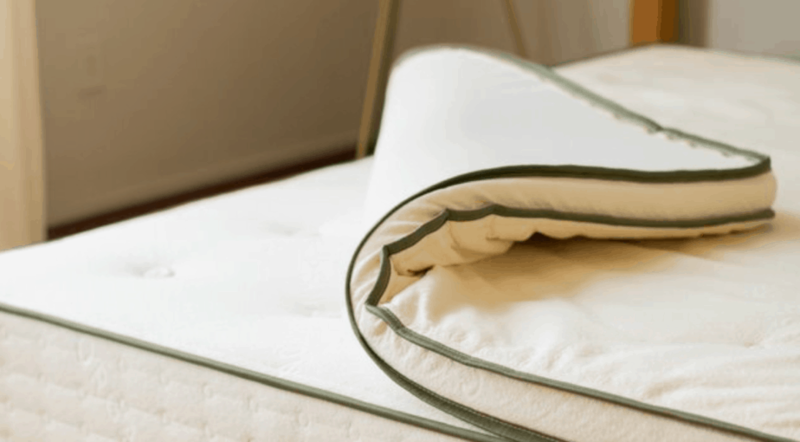 All the mattress toppers we’ve listed here have a few things in common. Their prices all reflect their queen size versions. They all rate at 24-30 ILD (the medium and most popular rating for “softness”), and they are all between 2 and 3 inches in thickness. Most of these toppers are available in different sizes, softness ratings, or thicknesses, at a different price. We’ve put together a ranking of the best mattresses — but if you’re not quite ready to commit to that yet, mattress toppers are the perfect place to start. Keep reading for everything you need to know about choosing the right mattress topper for your best night of sleep yet. Allow us to introduce you to the topper of your dreams. This 2-inch slice of heaven provides just the right balance of plushy comfort and support. It’s soft and offers some sink, but it’ll compress under pressure points like your hips and shoulders to help you sleep well and wake rested. Needing only an occasional fluffing, this downy topper offers the best in softness. 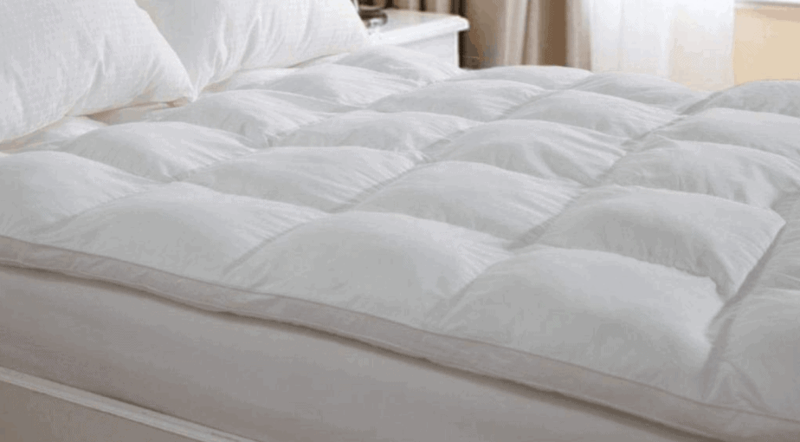 Enjoy a traditional, nest-like approach to sleep with 3 inches of microfiber stuffing. This product is easy to personalize to meet your nighttime needs without breaking the bank. Made with environmentally conscious practices, this topper offers bounciness as well as support. Not sure whether you want wool or latex? The Avocado combines the best of both worlds: the springy pressure-point comfort of latex with the temperature-regulating softness of wool. High-quality sleep is critical to your health — physically, mentally, and socially. Everything else you do depends on it. Despite the importance of a good night’s rest to our overall health, millions of American adults struggle to get the sleep they need. But we have good news: Many people can radically improve their sleep in a single step by purchasing a mattress topper. Mattress toppers don’t just make it easier to fall asleep, however. They can improve circulation, relieve joint and back pain, and even regulate body temperature. If you’re among the one-third of Americans who don’t get enough sleep, a mattress topper is one of the best purchases you can make to ensure you’re getting the rest you need. To help you start leading a healthier, more productive life, we’ve prepared this guide to the different types of mattress toppers and their benefits. 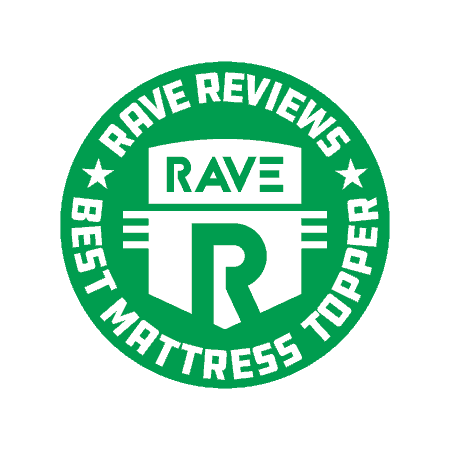 Since the invention of memory foam in the ’70s, these toppers have become the standard. They are by far the most popular. Memory foam toppers vary significantly in price, but it’s not too difficult to find a good one for cheap. What makes memory foam distinct from other materials is the way it contours to your body. This allows you to sleep in any position comfortably, whether on your back, stomach, or side. This property also makes memory foam especially effective at “cradling” the body, which reduces pressure on arthritic or achy joints. That’s why memory foam is often recommended by physical therapists for those recovering from an injury or experiencing chronic joint or back pain. Memory foam often has a distinct chemical odor when it’s new. This can usually be fixed by airing out the topper for a few days after opening it. For cheaper toppers, the smell may linger longer. Because memory foam is essentially polyurethane with chemically enhanced density, it is not very breathable. This means it’s not able to effectively distribute body heat, so some sleepers will get quite hot on standard memory foam. Many recent models overcome this problem by infusing the foam with gel or copper. Down, or feather, toppers are as traditional as it gets. Not many modern toppers are stuffed with actual feathers due to the risk of allergens. These days, microfiber is the standard. Down toppers do not offer the pressure-point relief of foam or latex toppers. But they do offer a unique sense of comfort that, depending on your tastes, may give you a better night’s sleep. This material is the top choice for people who want a more nest-like approach to sleep. It gives you some control over the landscape of your bed: You conform it to your preferences. In addition to allergens, there are other downsides (…get it?). If the stuffing is feathers, the shafts can poke through the material. If it’s microfiber, then moving around can be noisy. Down toppers tend to deflate over time and require periodic refluffing. That said, down is extremely soft and runs cheaper than foam or latex. It is also better at distributing heat. Some people dislike the “sinking” sensation of memory foam. (“It’s like sleeping on silly-putty,” as one reviewer put it.) Latex is distinct because it is “springy” instead of “sinky.” It imitates memory foam in the way it contours to your body, but it offers some resistance. Unlike memory foam, the impression your body leaves behind on latex will vanish as soon as you get up. Think of it like this: Memory foam molds around your body, but latex hugs your body. Some people like this better. Others find it too firm. Latex is marketed as a greener option, as it’s usually made of all-natural botanical materials. It is also hypoallergenic and antimicrobial. It’s more durable than memory foam, and offers the same pressure-point relief. One disadvantage is that latex toppers are usually the most expensive on the market. Cheap ones have a rubbery smell that can take several days to go away. Like down, wool toppers entice sleepers with a layer of added softness. They have fewer medical benefits than memory foam or latex, but many sleepers simply find them more comfortable. That isn’t to suggest there are no benefits to a wool topper. Wool is unique because it regulates heat better than almost any other material. It keeps you warm in the winter and cool in the summer. It is also antimicrobial and hypoallergenic for most people. Wool toppers can be hard to find. This is a shame since they are probably the softest topper out there, and if you’re like me, you actually like that sweet wool smell — though it does go away after a few days of airing. Wool is also quite durable, so while wool toppers tend to be pricey, a single purchase will last several years. Mattress toppers come in many varieties. Not only do their materials differ, but also their level of softness, support, heat distribution, and even smell! Softness: Is it available in “medium” firmness (the most popular)? Size: Is it available for a queen-sized bed? What about other sizes? Thickness: Is it available in a thickness of at least 2 inches, and at most 4? Temperature regulation: Does it distribute body heat effectively to prevent sweating? Health: Is the material hypoallergenic? Antimicrobial? Warranty: How long is the warranty (if there is one)? Reviews: What are the sleeping experiences of real users? With this information, you’re well-prepared to embark on your mattress topper mission. All we’ll say now is good luck, and good night. 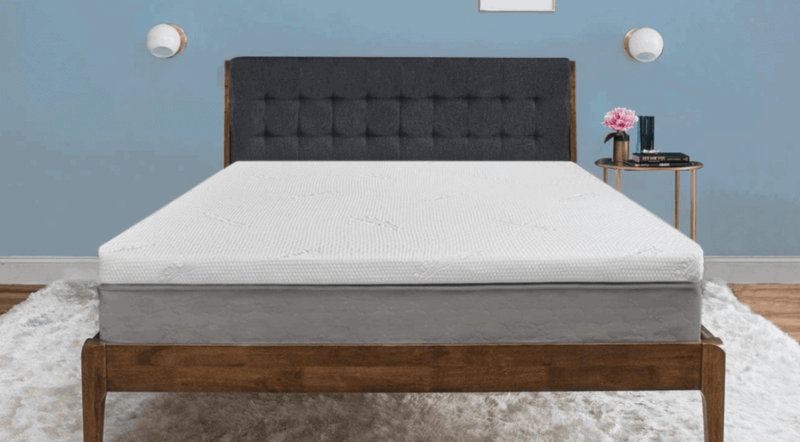 With its 2 inches of premium memory foam, this is one of those rare mattress toppers that hits the right balance of cushy comfort and support. It’s versatile enough to suit all sleeping styles, from back sleepers to stomach sleepers to side sleepers. And if you already have the dual-firmness flippable Layla mattress, you can use the Layla Topper to further customize your bed’s comfort level. The unique construction of the Layla Topper features copper gel beads embedded in the foam, which are designed to absorb heat from your body and pull it away from you while you sleep. The result is a cooler sleeping experience that’s perfect for those who sleep hot, even if they’ve found other memory foams too hot to be comfortable. If you need further reassurance, look to the Layla Topper’s 120-night sleep trial and 5-year warranty. It’s not hard to see why this mattress topper is a fan favorite and our hands-down overall winner for the best mattress topper. 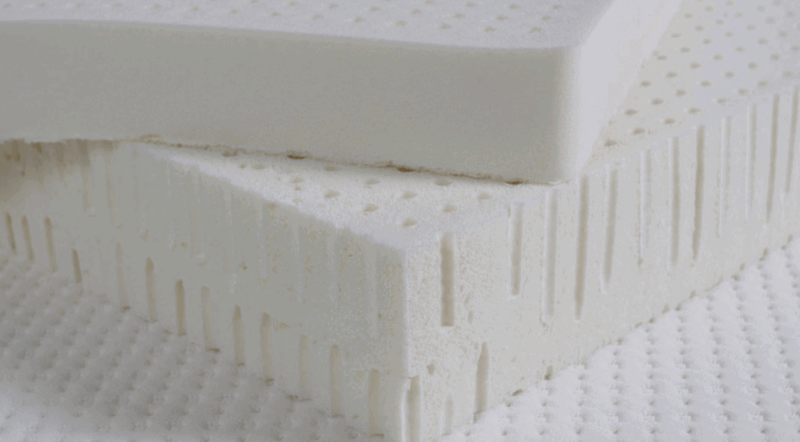 Tempur-Pedic is the premier name in the memory foam market. And the Tempur-Topper Supreme is their premier product. It’s a bit pricey, but no mattress topper tests better at cradling pressure points. And it’s specially designed to never overheat sleepers. In short, it has all the virtues of memory foam and none of the vices. The Tempur-Topper Supreme is a long-term solution. The 3-inch foam is heavy and substantial: It will not flatten under your body weight overnight (or overdecade). It’s not so soft that your body will sink to the bottom. But it’s not so dense that it won’t sculpt around your hips and shoulders. This is an outstanding choice for both support and comfort. It’s the topper that’s perhaps most responsible for converting people into believers in memory foam. With this product, Tempur-Pedic definitely proves why it’s still one of the best in the business. Few foam toppers have accrued as enthusiastic a following as this topper from Red Nomad. Although it may appear to be little more than a slab of foam, an army of happy customers report the Red Nomad is in fact a near-miraculous slice of cloud. Not only is it a dream to sleep on, but over time, it can ease joint and back pain too. Considering the low price tag (just $120), these claims are enough to blink at. But with a 90-day money-back guarantee, it seems the manufacturers are just as confident in their product as their devoted buyers. And if we’re being honest, this product is miles above many pricier alternatives. The Red Nomad is designed to accommodate any sleeping position. The Cool Cycle Polymer design ventilates body heat like a gel-infused topper, so sleepers don’t sweat overnight. This is 3 inches of cooling comfort you aren’t likely to find elsewhere in this price range. Not only is this topper affordable, but it’s much better quality than many pricier memory foam toppers. However, the price tag does come with some setbacks. For instance, this topper does not include a cloth cover, so make sure you purchase one separately. The Gel Swirl is also reported to have an odor which dissipates after about 2 days of airing out. While lacking the level of luxury you find with other memory foam toppers, this topper will definitely give your night an extra layer of comfort. If you don’t have any chronic pain in your back, joints, or hips, then this might just be all you need for a restful night’s sleep. Manufactured in Ohio and stuffed with 3 inches of plush microfiber, the Parachute Down Alternative is the best version of the traditional feather topper. Like all down and down alternative toppers, it requires occasional fluffing. But with proper care, it manages to retain its pillowy softness over years of use. The grid-like baffle-box construction of the cotton shell keeps the distribution of the microfibers consistent. Yet it also allows sleepers to mold their bedding in a way that gives it a landscape, maximizing your personal sense of comfort. While lacking the pressure-point relief promised by memory foam toppers, the Down Alternative rewards a more traditional, burrow-like approach to sleep. The Down Alternative is not waterproof and requires dry-cleaning. It may not be the first choice of sleepers with kids or pets. But if you’re looking for a down mattress topper, this one is absolutely worth a try — and Parachute guarantees free returns for the first 60 days from purchase. The only topper from Duck & Goose, Co., this downy topper is a more affordable alternative to the Parachute. Not only does it boast a small price tag, but the D&G sees itself as a strong competitor to memory foam. 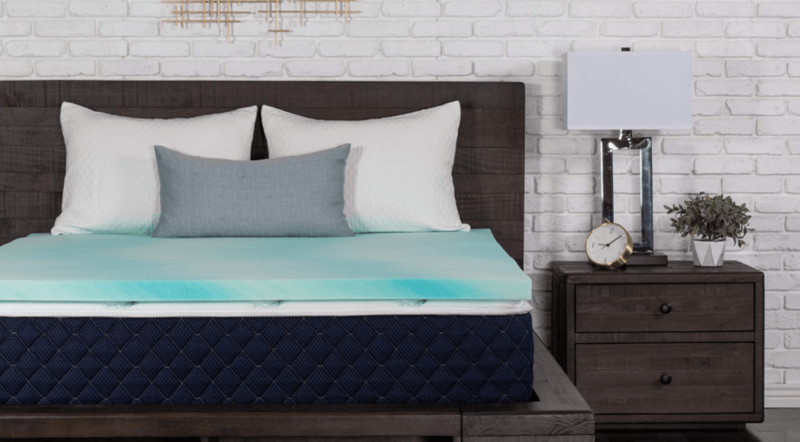 It challenges memory foam’s stickiness with softness, and as a contrast to foam’s infamous chemical odor, this topper is made with entirely hypoallergenic and antibacterial materials. This down topper actively repels dust mites and allergens. This makes it a first choice for anyone with sensitive allergies. It’s also machine-washable and dry-able. Clearly, this product is tough as nails yet soft as clouds. Though it will require frequent fluffing to retain that oh-so-desirable downiness, the 10-year warranty says it all: This product is made to last. With the D&G Synthetic Down Topper, softness meets durability. If you take care of it, it will take care of you and give you many restful nights. If you want the real McCoy, here it is. 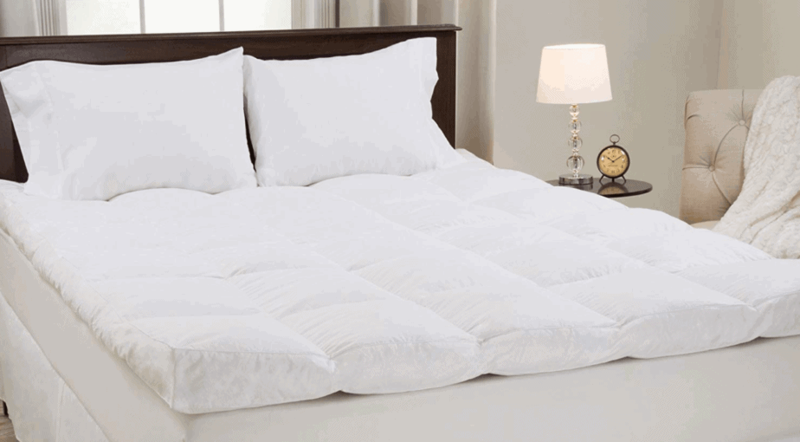 The Down and Duck by Bluestone is stuffed entirely with feathers sealed in 223-thread-count cotton. This is as authentic as it gets. The stuffing is 95% duck feathers and (get this…) 5% downy duck feathers — and there’s 4 inches of it! There’s a price for authenticity. The Down and Duck must be refluffed weekly and there’s always the threat of getting pricked by feather stems through the cotton. But the baffle-box design evens out the distribution of the stuffing and helps to maximize fluffiness. If nothing but real down will do, the Bluestone topper is definitely a good choice. And with that price tag, it’s certainly easy on your budget. 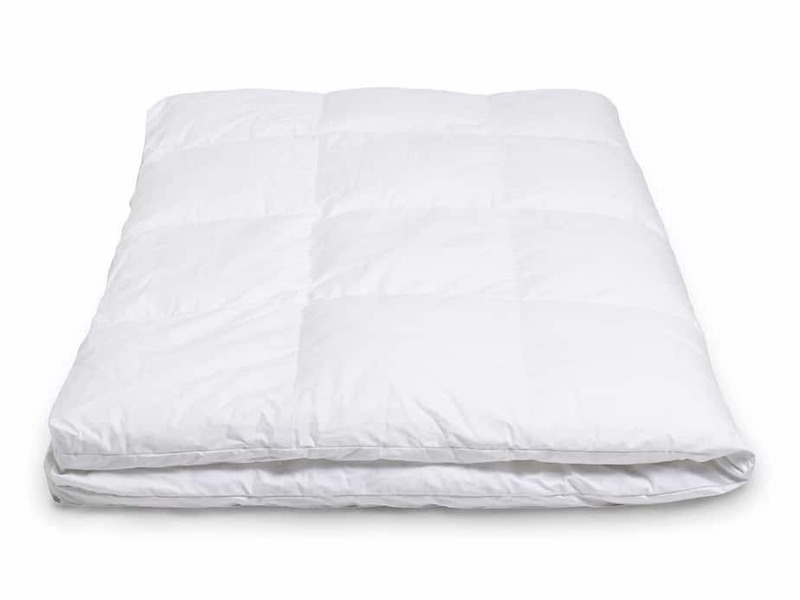 In the end, this topper is more of a glorified pillow to give your bed some landscape and softness, but it won’t necessarily give you any more support. The advantage of latex over other materials is the level of control they give buyers. Latex mattress toppers are easy to personalize. You can buy them thin at 1 inch, intermediate at 2 inches, or luxuriant at 3 inches. You can also choose the level of firmness: soft (20 ILD), medium (30 ILD), or firm (44 ILD). Point being, latex is for knowledgeable buyers who know what they want. This control often corresponds to high prices. But the Pure Green topper by Sleep On Latex is the best of both worlds. It is easy to personalize yet one of the cheapest on the market. Rather than sculpting around your body like memory foam, the Pure Green has a springy character. It pushes back against you and pops back up when you leave. Like memory foam, the Pure Green is heavy, weighing in at 30 pounds. However, it is more breathable than foam. A cover is available to purchase separately. Most sellers don’t offer the option of a cover, so we consider this a win! The company also offers a 5-year warranty and 30 days for a free return — which is one of the more generous policies we have seen. A common complaint against latex toppers is that they create problems for people with allergies. Barring an allergy to latex itself, this is one of the cleanest toppers on the list. The 100% Natural Talalay by PlushBed is “clean” in many senses: Not only is it hypoallergenic, odor-free, antimicrobial, inhospitable to dust mites, and mildew-resistant, but it is a green product certified by OEKO-TEX Standard 100 and GreenGuard Gold. Like the best on offer in the world of latex, the PlushBed provides options. Their bestselling model is 3 inches and medium-firm (24-26 ILD). Unfortunately, returns are not allowed. But there is a generous warranty: 25 years(! ), to be exact. The all-natural botanical latex contains no synthetic petroleum-based products, clay fillers, chemical dyes, pesticides, bleach, or carcinogenic adhesives. If you’re looking for the most environmentally friendly, health-conscious, and bouncy topper on the market, this is probably the one for you. Latex, like memory foam, is often poor at distributing body heat. The PangeaBed Ultimate Copper Topper overcomes this natural vice by infusing 100% pure botanical latex with copper. No element distributes heat better than copper — which is why so many professional chefs use copper cookware. The result? A topper that regulates your temperature better than just about anything on the market. The copper infusion has other benefits. It makes the topper naturally antibacterial, antimicrobial, hypoallergenic, dust mite-resistant, and anti-fungal. It’s even reported to improve blood flow in sleepers, making it the perfect choice for sleepers with poor circulation. One of the few downsides is the price tag — this’ll take a serious bite out of your bedroom furnishing budget. The other disadvantage is that the PangeaBed is not customizable. All toppers are 2 inches thick and medium firm, and they all include a relatively meager 1-year warranty. But this topper does come with a generous 30-night sleep trial. Yes, we are cheating a bit here. 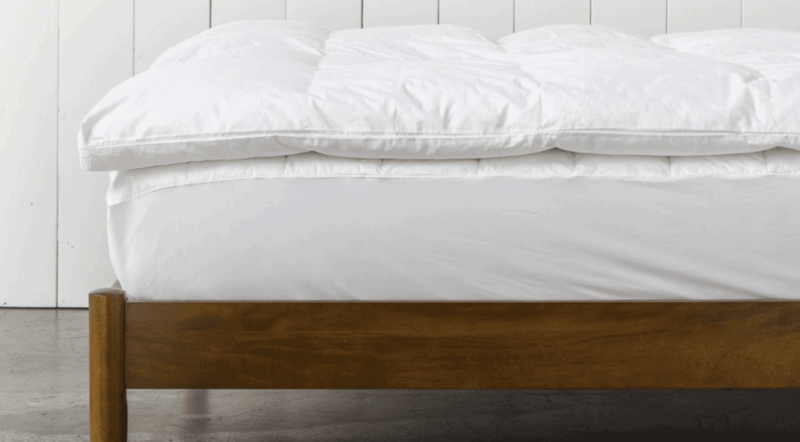 The Avocado Mattress Topper is technically made of all-natural botanical latex. But this is perfectly complemented with a GOTS-certified organic wool cover. While most latex toppers are just a slab, this is really a wool topper with a latex filling. And what a happy marriage it is! In addition to the springy, pressure-point-cradling luxury of latex, you also get wool’s thermoregulation properties. Wool wicks away moisture, adds bounce, and allows air to circulate naturally. While the latex does the heavy lifting for support and shapeliness, the wool keeps you warm in the winter, cool in the summer, and adds that distinctive softness that latex lacks! The Avocado may be the most luxurious topper on our ranking. All 2 inches of thickness are totally organic, non-toxic, and GreenGuard Gold-certified, making it one of the greenest and cleanest toppers on the market. And the 10-year warranty and 100-night return policy is among the most generous we’ve seen. As we’ve noted, wool is something of the premier fiber for bedding. It’s simply the softest (and sweetest-smelling) fiber you can buy. And the best wool is merino. 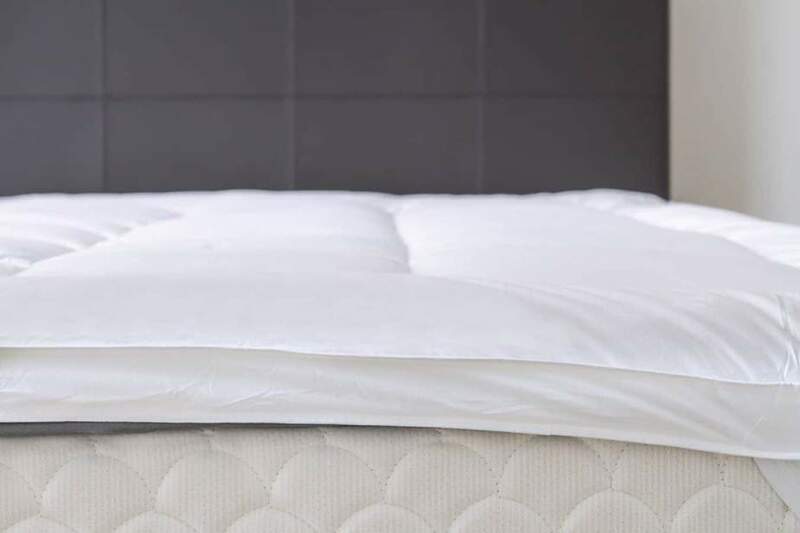 The Sleep & Beyond Organic Merino Wool Mattress Topper is particularly soothing for individuals who may have multiple chemical sensitivities and allergies, or those suffer from discomfort due to arthritis or fibromyalgia. This topper is amazingly durable, and can easily last for years with proper care. Thanks to its outstanding temperature-regulating properties, it wicks away sweat without leaving you feeling clammy. And Sleep & Beyond is serious about their commitment to organic practices: This topper’s been third-party certified for meeting the industry’s leading organic standards for both its merino wool and its cotton casing. The Sleep & Beyond topper is 1.5 inches of best-in-class wool coziness. And if that wasn’t enough to help you rest easily, 5% of all proceeds from each purchase goes to charity! When it comes to mattress toppers, the Cuddledown Plush Wool Fleece Mattress Topper is as straightforward as it gets. 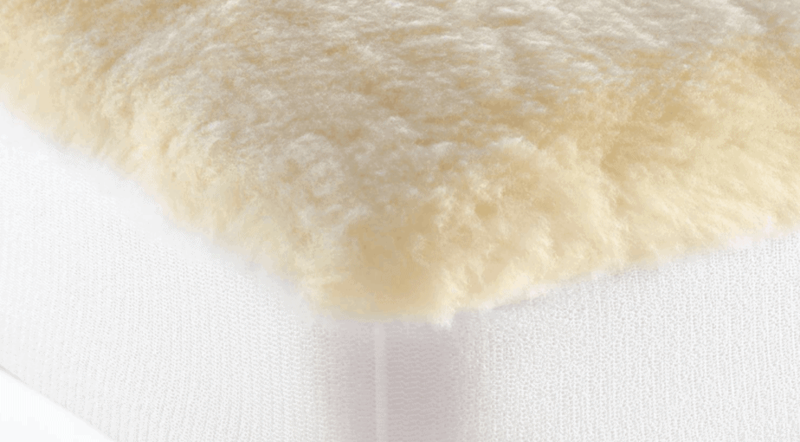 Made from top-grade American virgin wool, this topper adds a layer of softness to your mattress. Its distinctive fleecy exterior makes it seem like you’re sleeping on a huge, cozy pelt. This product is machine-washable and can even go in your dryer. It boasts all the advantages of wool: It will naturally wick away moisture, effectively redistribute your body heat, and resist both dust mites and bacteria. Cuddledown offers an unconditional guarantee to accept all returns. However, they do not list any warranty. Manage your expectations with the Cuddledown. This topper does not promise to erase joint or back pain. But if all you need is that sweet, sweet layer of softness, then you’re set! I have allergies. Which mattress topper should I get? Most of the mattress toppers on this list include features that make them more hypoallergenic. But if you want to play it safe, you have some options. Unless you are allergic to wool specifically, a wool topper is a good choice. Wool is naturally hypoallergenic and antimicrobial. It also wicks moisture more effectively than any other material, so mold and mildew are less likely. Similarly, unless you have a latex allergy, latex itself is hypoallergenic and antimicrobial. It is also more effective at fighting dust mites than other materials. In any event, either a wool or latex mattress topper would be easier on your sinuses than a bare mattress. What is an ILD rating? ILD stands for Indentation Load Deflection. It measures firmness, which is the amount of resistance the material provides against pressure. The lower the ILD, the softer the material. For a topper, an ILD of 12 would be so soft you’d sink right through it and hit the top of your mattress. An ILD of 50, on the other hand, is considered very firm for a topper. Firmness is different from density and recovery time, which are other industry measurements that often appear alongside ILD. Density is a measurement of the mass per unit volume, expressed as kilograms/m3 (cubic meters). Very soft (i.e. “plush”) density is 60 kg/m3. A material like latex is 95 kg/m3, meaning it will be very firm. Recovery time refers to the amount of time it takes for the material to return to its original shape. Memory foam usually recovers in 4-6 seconds when new. As it gets older, it could take several minutes to recover. Latex has a rapid recovery time (hence the “springiness”) and is usually more resistant to “fatigue” than memory foam, so it has a faster recovery time even when old. 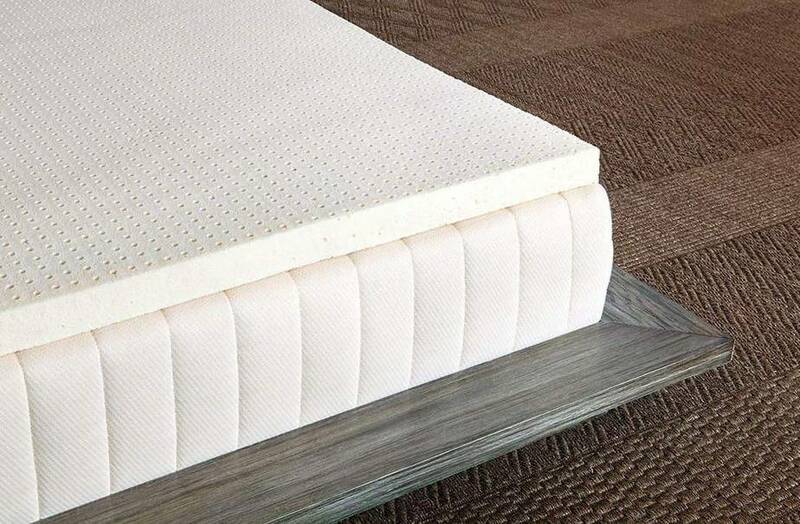 Should the contoured side of a mattress topper be facing up or down? 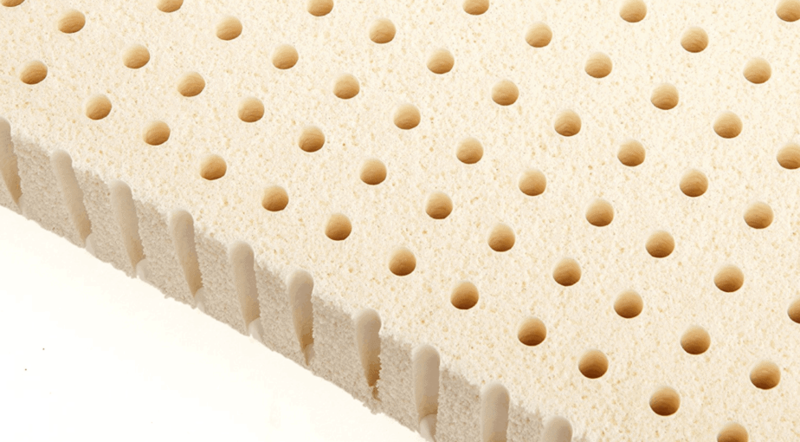 Some mattress toppers have contours or grooves molded over one surface. When the 2 sides are clearly different, you might think there must be a right way and a wrong way to place the topper on your bed. But really, there is no such thing as the right way to place the contours. It’s entirely a matter of preference. In fact, we recommend trying both sides and then settling with the one that feels right to you. I already own a mattress pad. Do I need a mattress topper? A mattress pad has a different objective than a topper. 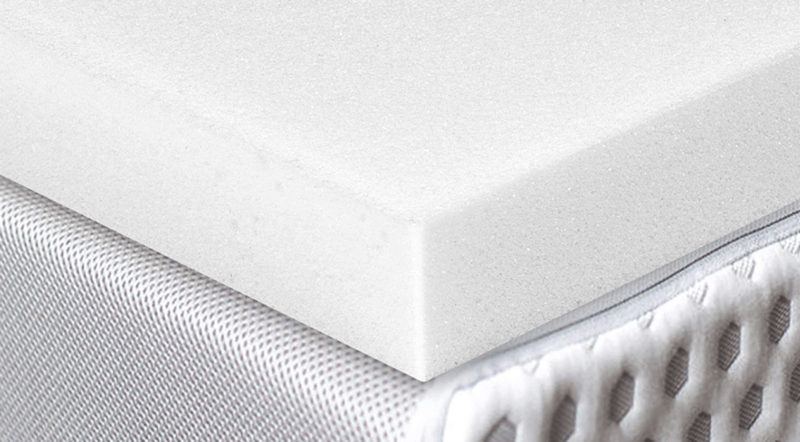 Unlike a topper, a pad just adds a layer of softness to your mattress. So really, it depends on how comfortable you find your mattress. If it is new and soft, you might get by with a pad. However, if you’re like most people, your mattress is getting old and might not be supportive enough for your needs. In that case, a pad may not do the trick. A topper is like a mini-mattress you can throw on top of your old one. Purchasing a topper will typically be cheaper than buying a new mattress, so it can be a great way to extend the life of your current mattress. What are the best mattress toppers? There is no such thing as the “best mattress topper.” There is only the mattress topper that accommodates your sleeping style and improves your rest, and the ones that don’t. The only best is the best for you. Full stop. That said, if you’re analyzing your sleeping style for the first time, there are some helpful things to know. Going with what is popular is a good place to start. Most likely, you’re like most people. In that realm, memory foam is king. Go for something that’s about 2 to 3 inches thick, with a medium softness rating (25-30 ILD). Purchase a cover separately (preferably wool) if one is not included, and BOOM: You have the basic profile of a best-selling mattress topper. If you want our advice for something tried and true, the best memory foam mattress topper — and our pick for the best mattress topper overall — is the Layla Topper. With its unique copper infusion and pressure-relieving support, this topper has won the hearts of thousands of happy, well-rested customers. The Layla Topper is just one of your options, though — be sure to look through our full list of 13 mattress toppers to find the one that’s perfect for you. After purchasing a mattress topper, there are other steps you can take to get the most restful night possible. Check out these recommendations from our staff, and sleep well! Philips Wake-Up Light Alarm Clock: A screeching alarm clock is an unpleasant way to start the day. Wake up like your ancestors, with the help of (artificial) sunlight! 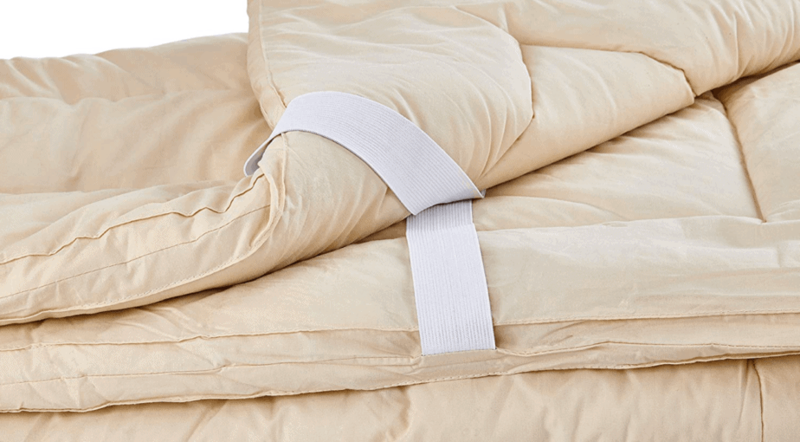 SafeGuard Pillow Protectors: Guard your pillow from allergens and microbes with the right cover. It’s easier to sleep without an itchy nose. Sycees Plug-in LED Night Light: Protect your shins with these best-sellers. Blake Adams is a widely published educator, journalist, and copywriter. He lives with his wife and cat in...*throws dart at a map*...Elburn, IL.